Over time I have noticed that when I paint, I am completely free. As an artist, I do not ask myself: Why? When? What? Where? How?The reason I don’t ask these questions is because I know the answer is always “It is perfect the way it is.” That is what I love about art. No matter what it is, or where it is in the process, it is always perfect. Art is about the process every bit as much as it is about the product. This photo is a perfect example. 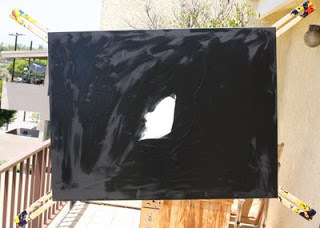 I could not figure out what to paint so I painted the canvas black. Before I finished I stopped, and it was perfect the way it was. With art, you never make a mistake because it is always perfect. You can do no wrong. You scratch the work and the scratch is supposed to be there. Art is always growing and changing. It has no right or wrong. No good or bad. No up or down. I love that. It gives me such freedom. I paint something, and if I don’t like it, (which is not wrong because everything is perfect) I just paint over it. To live in a world where you can make no mistakes is nirvana.